Just Romantic Suspense: What were you like in school? Congratulations to "Patricia B. ", the winner in Destiny's giveaway. Please contact JUST ROMANTIC SUSPENSE to claim your prize! Hello Just Romantic Suspense! I’m so excited to be back here! It’s back to school time. That means a strain on the wallet–school supplies, fees, pictures, anything needed for sports, etc. I always dread the homework drama. Then you have the constant illness, calls from the school… I promise I’m not trying to depress anyone. We’ll survive this! 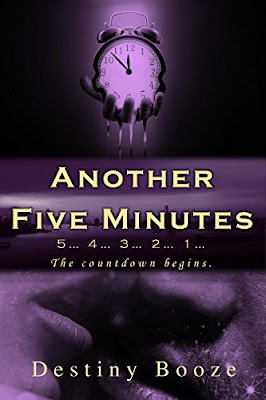 In the spirit of the mother sisterhood, I want to offer a Kindle copy of my new romantic suspense, Another Five Minutes. It’s a little free adult entertainment to celebrate the kick off of the school year. To win, leave a comment below telling us what you were like in school. I’ll start. In a word, I was unmemorable. I was that quiet girl that sat in the back of the class writing in a notebook or reading. Sometimes I was sleeping. When I think about it, maybe I haven’t changed so much. Lol. What were you like? Destiny Booze is a romantic suspense/thriller author. Her writing career began as a community journalist. In May of 2009, she released her debut romantic suspense novel, Altered Beginnings. She currently resides in Botetourt County, Virginia with her husband, son, and house full of pets where she strives to be the best wife, mother, and writer she can be. Her family is always priority number one. Other things of great importance to her are her friends and her readers! Giveaway ends 11:59pm EST August 26th. Due to GDPR regulations you no longer need to submit your email address in the comments. If you have been selected as a winner your name will be posted at the top of the post. You may then contact maureen@justromanticsuspense.com to claim your prize. Your email address will be shared with the author/publicist providing the giveaway. I love that! So, you actually liked school! I loved reading and learning but was frequently the new kid as my dad was transferred from Georgia to California to Alabama and just as I found myself in high school, back to Georgia for my senior year. I liked being able to reinvent myself but wish I had close friends other people have maintained. That would be hard. I don't think I could have done that. It was hard for me to open up to people and make friends. I too was a quiet one. I tried to sit towards the front of the classroom, took bunches of notes (still do), and was always up late doing homework. I was a pretty good student and liked most subjects. Math and science were my favorites. Now I still enjoy science but history has moved up in favor. I had a nasty history teacher who spoiled it for me. Reading has always been a favorite. You had such a good work ethic. And yes, yes, yes to reading! It saved me as a teenager! I needed that escape.